Where Will the Apple Drop? Many moons ago, when your author was young and blissfully new to the county, we wrote our very first blog post on the mighty Apple Ballot. It was unimaginatively titled, “The 800 lb Gorilla of MoCo Politics.” Then as now, the Apple was one of the most coveted endorsements in MoCo. But my oh my, so much has changed. 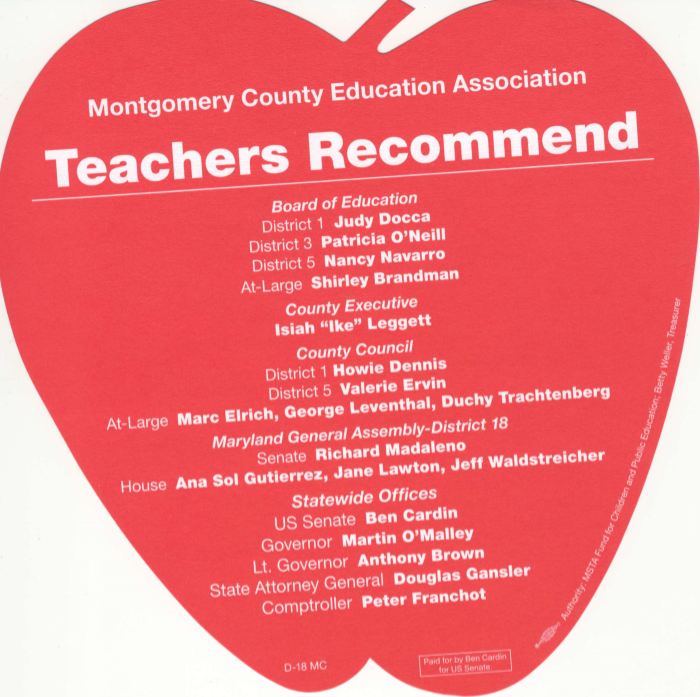 Back in the Age of the Golden Apple, the Montgomery County Education Association (MCEA) was the centerpiece of a powerful political organization created by then-Superintendent Jerry Weast. Weast was not a pro-union progressive by nature, but he understood that politics is a team sport and it was necessary to play it to get money. So the Weast Machine included the education unions (MCEA, SEIU and the principals), the PTAs, the Washington Post editorial page and the school system’s internal Ministry of Propaganda. (That was not its title, but you get the point!) Weast traded real input in the MCPS budget for stakeholders in return for absolute loyalty in joint combat against the outside – especially the County Council. Anyone who messed with the school system didn’t take on Weast alone – they had to go against the entire Machine. Weast capitalized on his organization as well as productive relationships with County Executive Doug Duncan and County Council Education Committee Chair Mike Subin to get substantial and regular budget increases. The whole system was greased by strong revenue growth and occasional tax hikes. The District 18/Silver Spring version of the Apple Ballot from 2006. This is the document that began your author’s career in blogging. Those days are long gone. Three major changes have occurred over the last ten years. First, Weast jumped the shark – not once, but twice. His first big sin was calling union leaders to his house to ask them to endorse Nancy Navarro in the 2008 Council District 4 special election. That attracted criticism from multiple Council Members as inappropriate conduct by an appointed non-partisan administrator. His second big sin was threatening to sue the county over a budget disagreement two years later. These kinds of behavior helped convince Weast’s adversaries that he was not merely an irritant, but an actual threat, and prompted some to brand him a Rogue Superintendent. That set the stage for the bitter budget battles to come. Second, the county and regional economies were greatly weakened in the wake of the Great Recession. 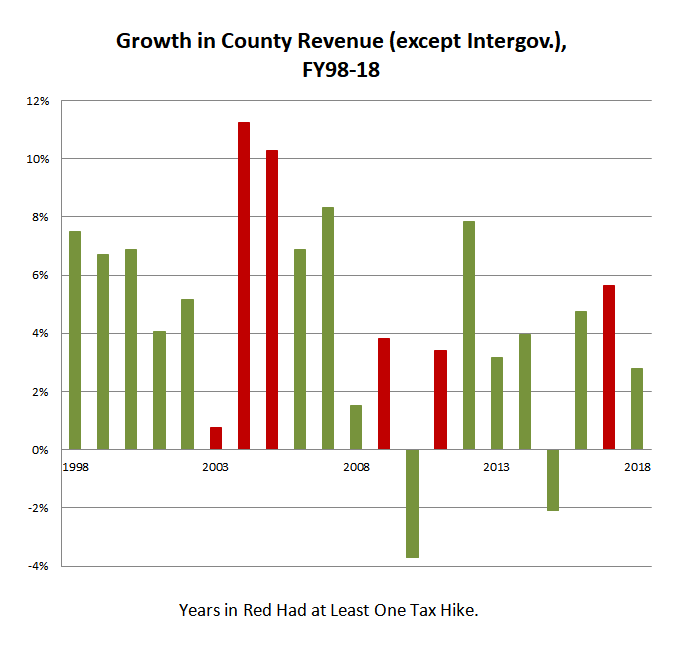 The chart below shows growth in county revenue (excluding intergovernmental aid) over the last twenty years. 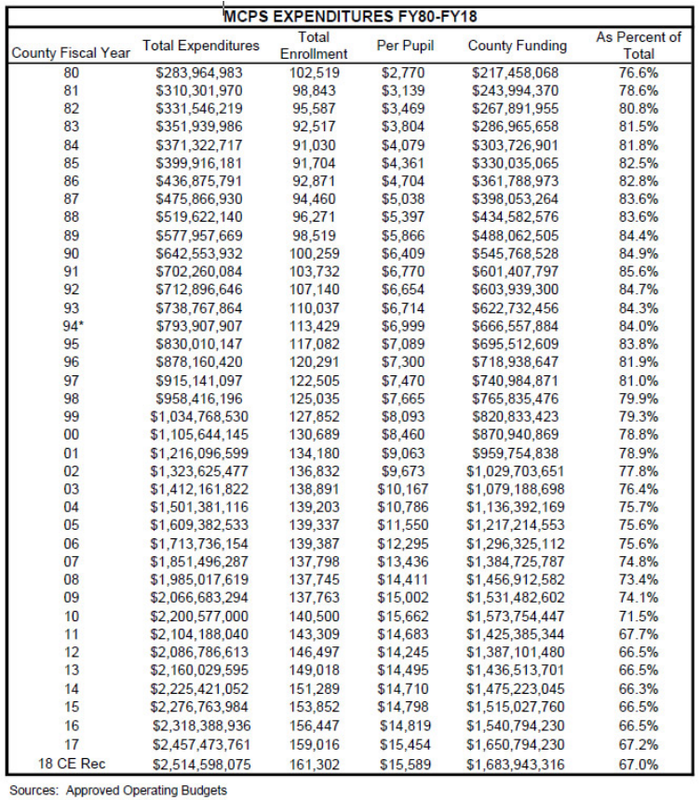 Red bars indicate years in which major tax hikes were passed. From FY98 through FY09, a generally prosperous economy helped county revenues grow by an annual average of 6.2%. But from FY10 through FY18, the days of the Great Recession and beyond, county revenues grew by an annual average of 3.1%. (That does not include the recent $120 million budget shortfall.) There is simply not as much money to go around as there used to be. Accordingly, revitalizing the economy should be a huge policy objective for all of the county’s employee unions and everyone else who cares about funding local government. Third, the local money that was available was not as directed to MCPS as it once was. There are many reasons for that: the Holy War that broke out between the County Council and the school system in Weast’s final days; dissatisfaction with changes to the state’s Maintenance of Effort law; the state’s execrable decision to shift part of the teacher pension burden down to the counties, which is costing MoCo tens of millions of dollars every year and stifling funding for other priorities; and the growth of many other needs in the county’s budget. Council Member Nancy Floreen defended the county’s record on MCPS funding and your author offered a reply. Whatever the reasons, MCPS has not received operating fund increases commensurate with most of the rest of the government in recent years. 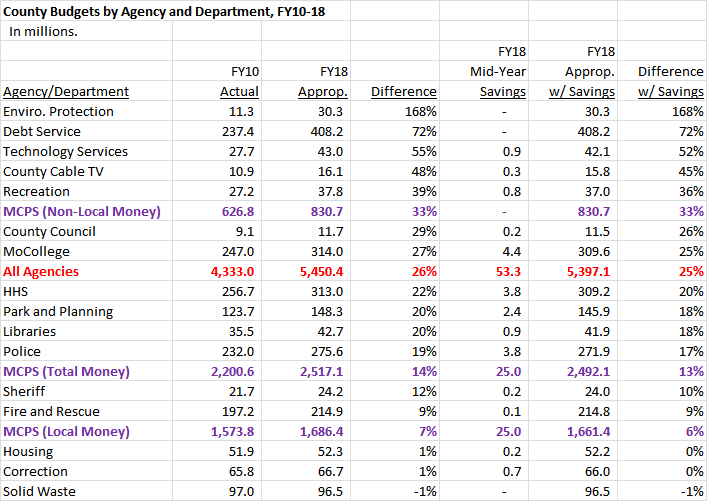 The chart below shows budgetary growth by major department and agency from FY10, the peak year before the Great Recession, through FY18. The effects of the recently approved mid-year savings plan are shown at right. Note that the time period includes the recession itself, the recovery years afterwards and the FY17 9% property tax hike which was marketed as a boost for education. MCPS’s total funding increased by 13% over these eight years, roughly half the 25% increase for the total county government. Non-local funding for the schools, the huge majority of which is state aid, went up by 33%. But local funding for the schools went up by just 6% as the county spent its own money disproportionately on other activities. Meanwhile, MCPS’s enrollment went up by 15% during this period. The Weast Machine has been shattered. Its demise was due to the decline of the economy, conscious policy choices by county decision makers and, ironically, because of the school system’s own leadership as well. The key moment came in the spring of 2016, when the County Council conditioned its offer of a substantial increase in MCPS funding on a requirement that it go to reducing class size and not to increasing teacher compensation. The Weast Machine would have resisted that condition, but the system’s leadership agreed to it. And so the council voted unanimously to instruct the school system to shift $37 million from employee compensation to class size reduction and the school system reduced teacher raises to comply. The legacy of this moment is that there is no longer a united front between MCPS leaders and their unions – a major loss of leverage in the school system’s dealings with county electeds. The end result was not so great for the council either as voters, displeased by the big tax hike that year and not mollified by the compensation changes, went on to overwhelmingly approve term limits. 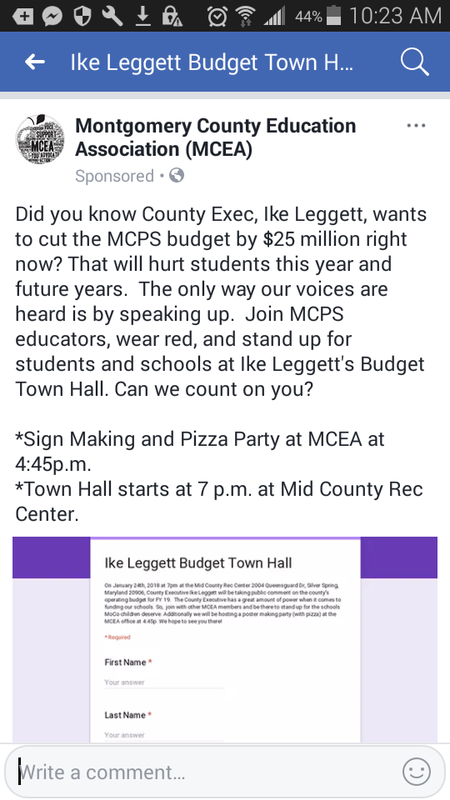 MCEA runs a Facebook ad against the $25 million mid-year cut to MCPS. The union flooded a town hall meeting with the County Executive to protest it but the County Council approved the cut unanimously. MCEA will be deciding its 2018 endorsements for county office in the weeks to come. In the contested races for County Executive, Council At-Large and Council Districts 1 and 3, the mighty Apple Ballot could play a huge role. Where will the Apple drop? That depends on how MCEA answers the following two questions. What to Do With the Incumbents? Incumbents usually win and MCEA has endorsed the majority of them, including ones who were lukewarm on their issues, in the past. But in this case, most of the incumbent Council Members voted for multiple very tough budgets, all of them supported reducing teacher raises as a condition of approving more MCPS funding and all of them just voted for a $25 million mid-year cut to MCPS. Can those strikes be offset by other considerations? How to Find Someone Better? Let’s be fair to the incumbents: the recession, the new Maintenance of Effort law and the partial shift of teacher pension funding to the counties created very hard choices. No matter what they did, the incumbents would have offended someone. Would the legions of challengers now vying for the Apple’s attention really have done better? Which ones among them understand the very real and very complicated budget issues that face policy makers? Which ones will aggressively pursue economic revival, which is necessary for financing all county services – not just MCPS – and supporting justified raises for county employees? Which ones have the competence to deliver and the character to fight for teachers, parents and students alike? When those questions are answered, we will know where the Apple drops. End Note: For those who wish to study MCPS’s funding history, we reprint the following graphic from the County Executive’s recommended FY18 budget below.